The most popular cellphone dating app, Tinder, has expanded its gender options to include 37 choices of trans and non-conforming genders. 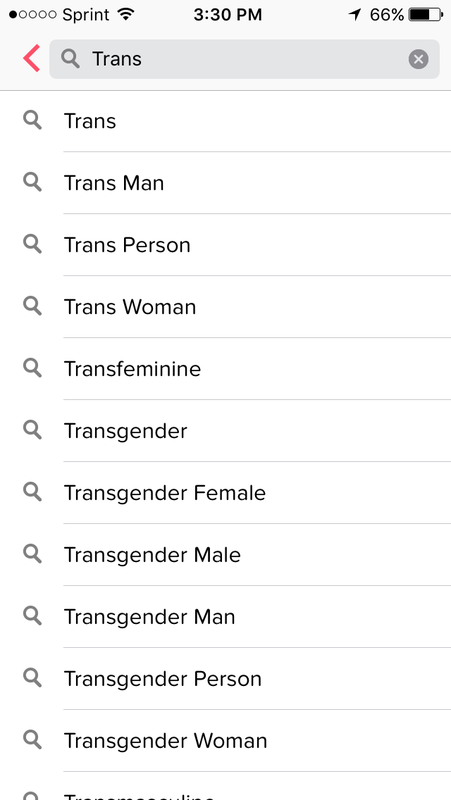 Before the change, added on Tuesday, users could opt to identify as only male or female on the app. The app has been criticized from the left for being too “heteronormative”, meaning that it promotes or normalizes traditional sexual orientations or gender identities, reportedly at the expense of the LGBTQ community. Tinder CEO Sean Rad,has said that he hopes the change will ease difficulties faced by the transgender community using his app. “Six months ago we discovered that the transgender community on Tinder was experiencing some harassment on the platform,” Rad stated. After hearing this, programmers at Tinder worked with representatives of GLAAD, an organization known for its advocacy for trans rights, to update the app to be more inclusive. When setting up a tinder account, one is confronted with three choices for gender: man, woman and more. When “more” is selected, users can type in whatever they want and are presented with suggestions. Examples of possible suggested genders are trans man, trans woman, transfeminine, pangender, androgynous, gender fluid and many others. Users can also customize their gender, writing something not included in the 37 suggested, man or woman. Below is a screenshot from the “more” search page. The app released a video on its twitter page promoting the new update. The account used the hashtag, #AlltypesAllSwipes. Tinder is also allocating additional resources to educate workers on how to support members of the transgender community who are facing abuse on their app.